A new school year is upon us, and catechists, teachers, and homeschoolers are making plans and preparations.What would Pope Francis say to us as we are getting ready? 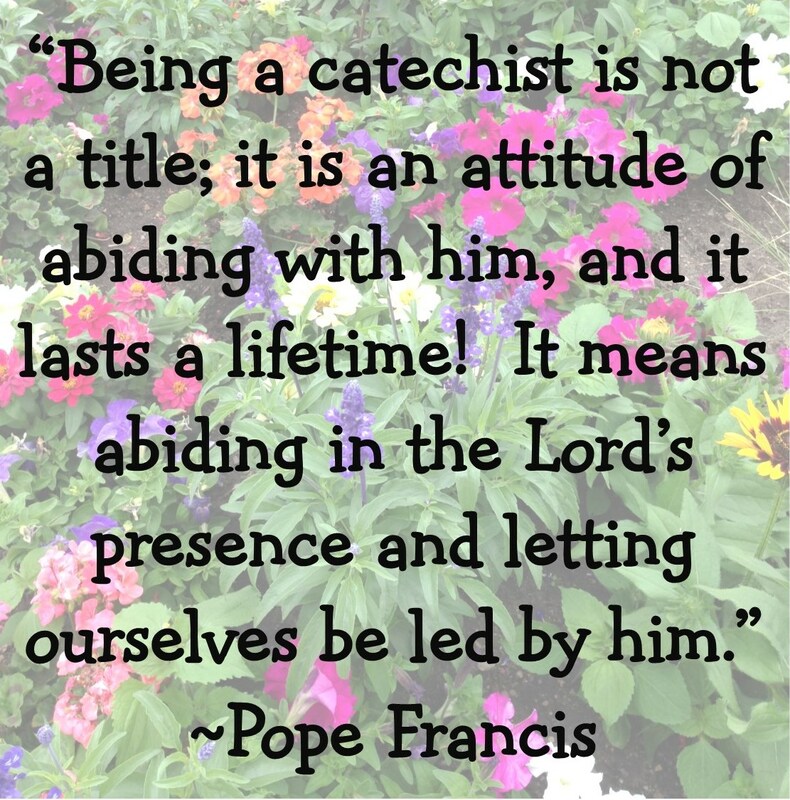 I recently read an address that Pope Francis gave to catechists on September 27, 2013. His advice is very relevant to all of us, especially because he is reminding us that catechesis is primarily about evangelization. Pope Francis’ teachings have challenged me to remember that we always need to be reaching out, inviting, and welcoming those around us. 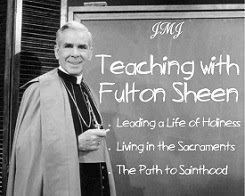 I’d like to share with you some of the advice he gave to all those who teach the faith. I also pulled out some of my favorite quotes from the address and turned them into images. 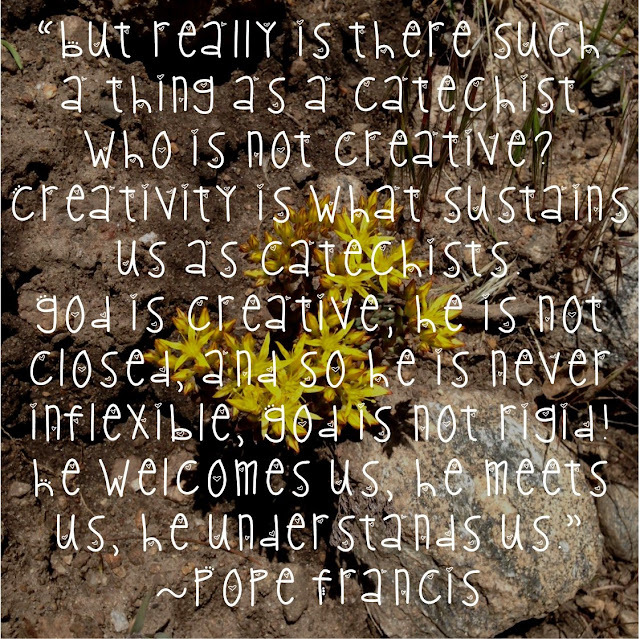 You are welcome to right click and save/print those images to hang up as a reminder for you or to give to your fellow catechists and teachers as the school years starts. We can’t share Jesus with others unless we ourselves know Him and are close to Him (Abide in Him- John 15). 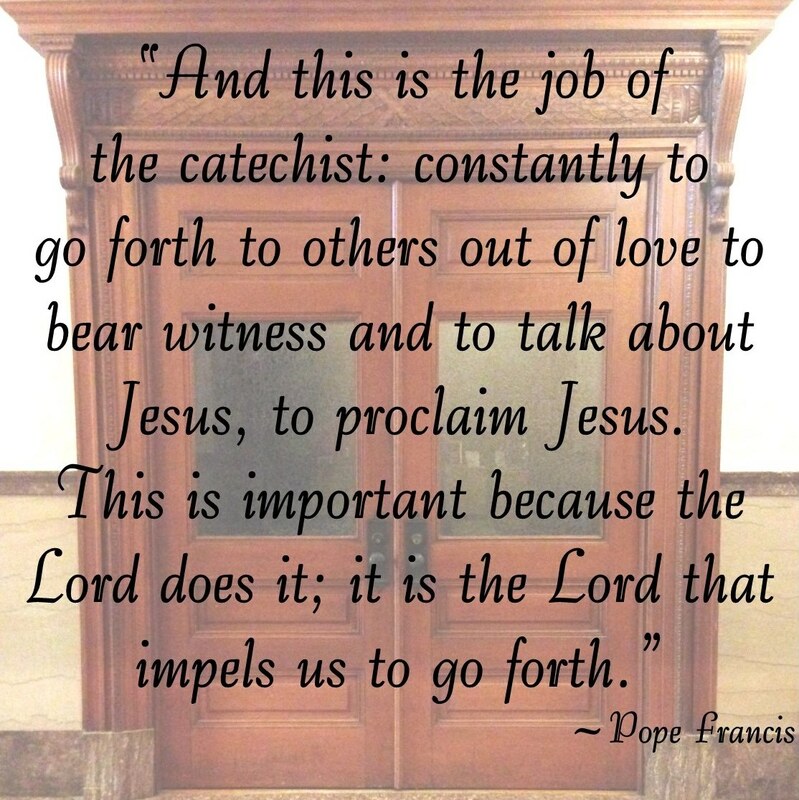 Pope Francis encourages us to spend time in prayer, to be with the Lord, to “ignite the fire of friendship with the Lord.” He reminds us that this prayer looks different for people- we have different callings and vocations. Pope Francis reminds us that real love is never selfish- God is always at the center and God gives himself away. When we have life in Christ, we are always open to others. Think of the example of Jonah- he was content with his pious life, and Nineveh was outside of his comfort zone. But, if we go to the outskirts, we will always find God there. He is always faithful, and he is always there first in the heart of the person that you will encounter. Isn’t that the truth! This isn’t an easy job, and you and I know that. We are fighting an uphill battle against sin, culture, lifestyles, media, etc. The mix of kids in our classrooms have needs that we can’t meet. We may feel inadequate, ill-equipped, and stretched thin. 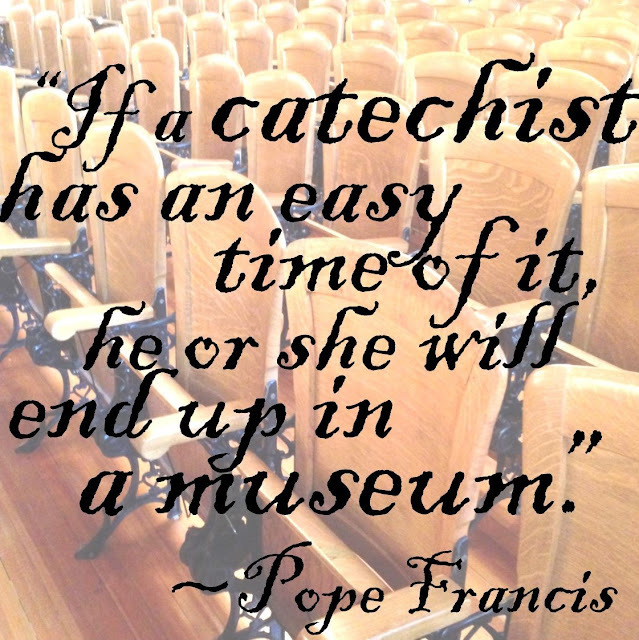 But that quote summarizes the work of being a catechist- it isn’t going to be easy. 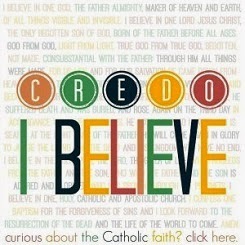 Embracing the cross and fighting for truth never is. We weren’t promised easy, but we are promised that Christ will be with us. We can remember that we are doing His work. We know that we can trust and abide in him and his perfect mercy. Thanks to all of you catechists and teachers of all kinds for being ready to do God’s work again this year. 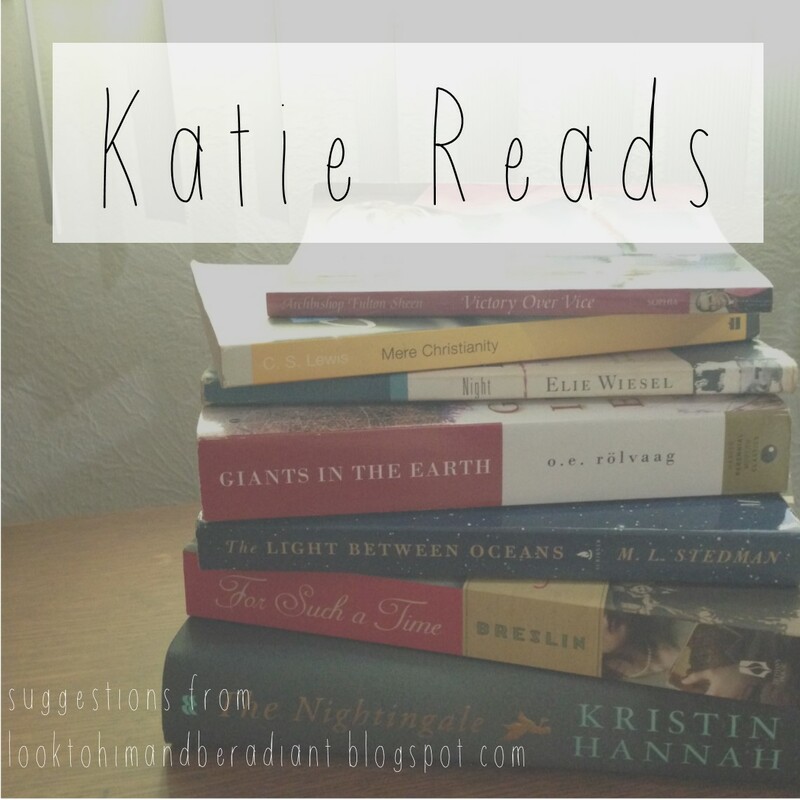 Linking up with Kelly- go visit her for more Quick Takes! 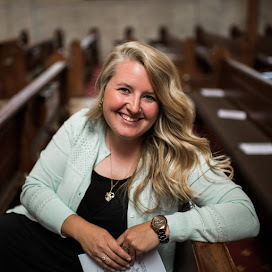 Have you heard of Adele Brise? I thought her mission from the blessed mother to chatechis young children was amazing and oh so important. Here is a little more about her if you never heard of her. Jackie, I had not heard of her, but I think I am going to enjoy reading more! The list that Our Lady gave her to teach is both simple and profound- salvation, prayer, sacraments. Thanks for introducing me!